School begins again and teachers check their websites and blogs as they get ready to greet their students. Don’t forget about Google’s “Google Doodle” contest for students in grades kindergarten to 12 in Canada to redesign the logo for the homepage. 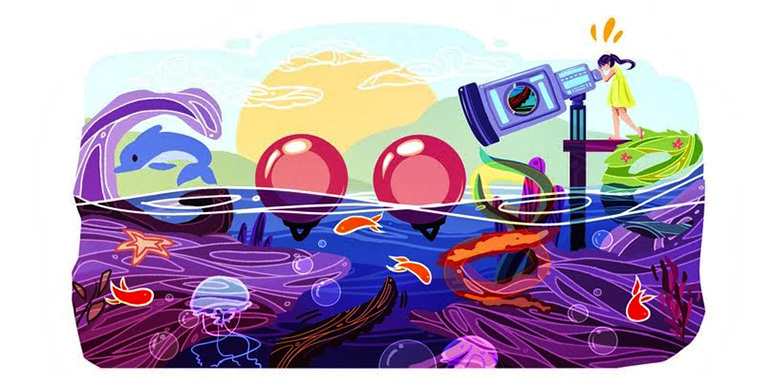 Last year’s contest closed in February and the winning doodle was featured on the Google Canada homepage for 24 hours. The winning student also received a $10,000 scholarship, a Google Chromebook, and a $10,000 grant to their current school along with a trip to Toronto to view a special exhibition of the top doodles at the Royal Ontario Museum. Here’s an example of a past winner. Cindy Tang, Dr. Norman Bethune C.I I said she would invent a telescope that would show us the depth of the sea (all of it). She was intrigued by the idea that we’ve discovered less than 5% of the ocean – 95% still left unseen by human eyes.